Although just 12 years old, Lucie has already been riding for eight years. She grew up in Port Hawkesbury in Cape Breton where there was a stable across the road. Lucie would go help with morning chores and then ride after school. She also rode with Nadine at Reaching Strides Equestrian Centre (where Punkin is enjoying her retirement). Lucie remarked that riding in Cape Breton was very different than Lancers because it was very rural and there were lots of pastures. Lucie moved to Halifax four years ago and started riding at Lancers in Ride 8. She then moved to Ride 6, then 5, and now is in Ride 4. You can usually find Lucie scurrying around the barn laughing with her ride-mates! (We actually found them mid-game of Hide and Go Seek when we interviewed her). Lucie’s favourite part about Lancers (in addition to the horses, of course), is that all her friends are here and that it is in the middle of the city. Lucie likes that she can walk to the barn from both her school and house and some of her fellow Lancers go to her school. Her favourite horse is Inga and we all know that Inga chooses her favourite riders! Lucie first rode Inga at Salmon River camp a few years ago and she then became her “show pony”. This year she was matched with her for the Musical Ride. Lucie says she prefers a slower horse and with Inga, it takes some leg but she is great fun. Chevy would be Lucie’s second favourite horse because she likes jumping him. In her lessons, Lucie has also had a chance to ride lots of different horses which is one of the benefits of riding at Lancers. 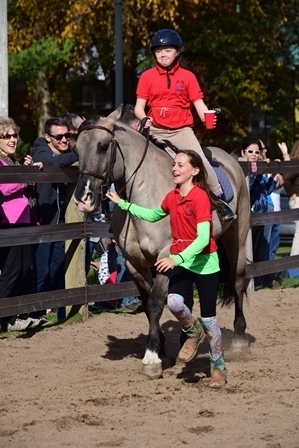 One of the things her instructors always appreciate about Lucie is that she is such a cheerleader for her fellow riders and she always brings a very positive attitude into the barn and ring with her. Over the years, Lucie has participated in many extra-curricular activities at Lancers. 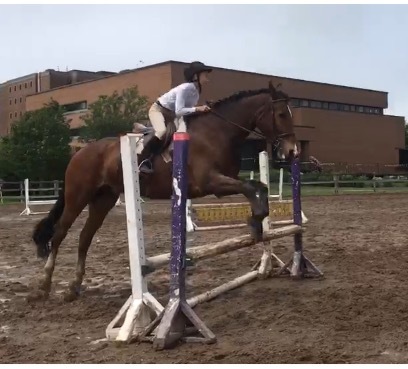 She has gone to Salmon River camp which is favourite memory, especially riding through the woods and having Chloe take them through the woods and over the jumps on foot so they would learn the course first. 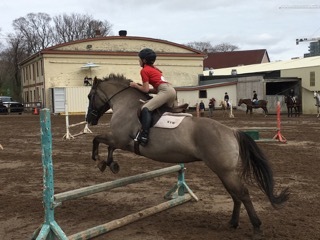 She likes to do Pony Club testing and her Rider Levels (she earned level 4 this year). She helps with shavings and hay deliveries and always sells fudge for the Junior Executive Christmas fundraiser. She likes to participate in our training shows, is known for her pairs class and “ride a buck” Halloween fun show wins, and has even done some off-property shows. A few years ago, she started as an Honour Guard for the Musical Ride and then became a spare and this was her first year riding in the Musical Ride! Lucie only had a few practices but says it was still a lot of fun. Lucie is very much looking forward to this year, especially because she has not been able to ride much in 2018. We had our quarantine in the summer. She enjoyed a few lessons back and Salmon River camp in August but on her second day of school, Lucie was playing soccer baseball but fell down and seriously injured her arm. She broke her arm in multiple spots, dislocated her elbow, fractured some bones, and had a bone lodge into her joint. She had to have a three-hour surgery to get the bone out of the socket and now has a screw in her elbow. She still does physio every week and really hopes to get clearance from the surgeon to be able to ride again soon. 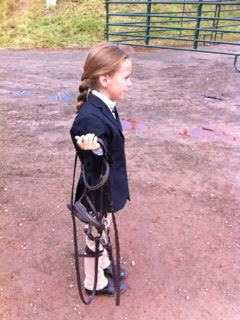 All riders know that riding horses takes patience and Lucie has certainly been exhibiting strong patience! She has also shown much dedication by still coming to her lessons as much as she can. She still learns in her lessons but says that “it is a whole different thing watching it than doing it on a horse but it is still good to watch”. Riding is Lucie’s main sport so hopefully, she can get back to it as soon as possible. 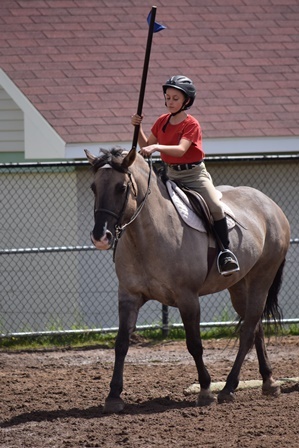 While thinking of getting back to riding, Lucie says that in her future, she would like to do as many rider levels as she can (and Pony Club too) and would like to qualify as an instructor. She is also excited to be old enough to begin working at Lancers in a few years as a stablehand. 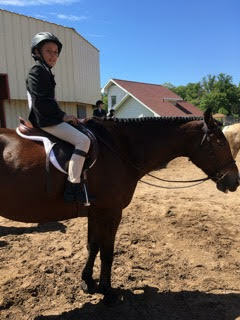 After that, Lucie would like to go to a college with a riding program or an equestrian team! 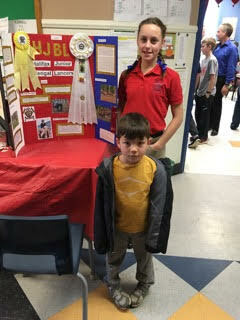 For now, Lucie is just enjoying meeting people at Lancers and all the positive influences it has on her life…. (Ok, and maybe having just a bit of anticipation to get back in the saddle)! Lucie, we are very excited to see what the future holds and all the great progress you are going to make, especially when you no longer play soccer baseball at school!